Park Place B305 is a high quality, reasonably priced condo just a short walk from the ski lifts and just one block from quaint downtown Breckenridge. You can walk anywhere - downtown restaurants, shops, clubs, taverns, and the ski lifts. It's across the street from the Riverwalk and Performing Arts Center, only two blocks from Snowflake and Quicksilver Ski Lifts and ski-in via Four O’Clock ski run. Each year we upgrade our home to create a fresh, inviting, lodge-home feeling in the cozy spaces of our condo. We strive to differentiate it from the other rental options you might choose by outfitting our place with high quality furnishings and carefully matched accessories and doing so without extra cost to you! We know from our own travels that we appreciate the finer things in life like quality and good design and we visit places that provide these to us. We hope you’ll do likewise and stay in our home to build wonderful memories of your own. 1 Block from Downtown Breckenridge, where all dining, shopping and nightlife options await. - partial views of mountain peaks 7 and 8 from great room, bedroom, and balcony. -- via Four O'clock Ski Run and walk out to 2 ski lifts only 800 yards away. -- with all amenities including Jenn-Aire stove with grill top. -- extensive CD music library for our guests' enjoyment. - extensive video/DVD movie library for our guests' enjoyment. -- comfortably furnished with partial views of mountain peaks 7 and 8. -- a short walk away along a tree-lined path (no streets). perfect spot for some spring skiing...thank you! Thank you for taking the time to leave this review. We are very happy to hear you enjoyed your stay with us and that you had a great time in Breck. We certainly hope to have the pleasure of hosting you again in future. Condo was great, had plenty of room for us and all the utensils and linens we needed. Hot water was an issue one morning but maintenance fixed it. Thank you for taking the time to write this review. We are glad that we managed to get the hot water sorted for you so quickly and very happy that you enjoyed the remainder of your stay with us and your time in Breck! We certainly hope we will have the pleasure of hosting you again in future. The property was well located to to village which made walking back and forth easy and enjoyable. Unfortunately whilst the overall apartment was well looked after the bed linen was sub standard. The sheets were old and scratchy and there were limited blankets, a duvet would have been great. The linen for the sleeper couch was also only ok! Thank you for taking the time to leave us a review. I'm happy to hear that you enjoyed the location of this unit, it really is in a prime spot! I do apologize that the sheets were not comfortable for you. I'll be sure to pass that along! If you stay with us in the future, feel free to give us a call and we'd be more than happy to deliver extra blankets. Thank you for your feedback as we always strive to improve. Come back and see us again soon! Had a great time. Very close to the snowflake lift and near Main Street. The apartment was nice and clean and made the stay very comfortable and like home! This was a nice, clean condo. 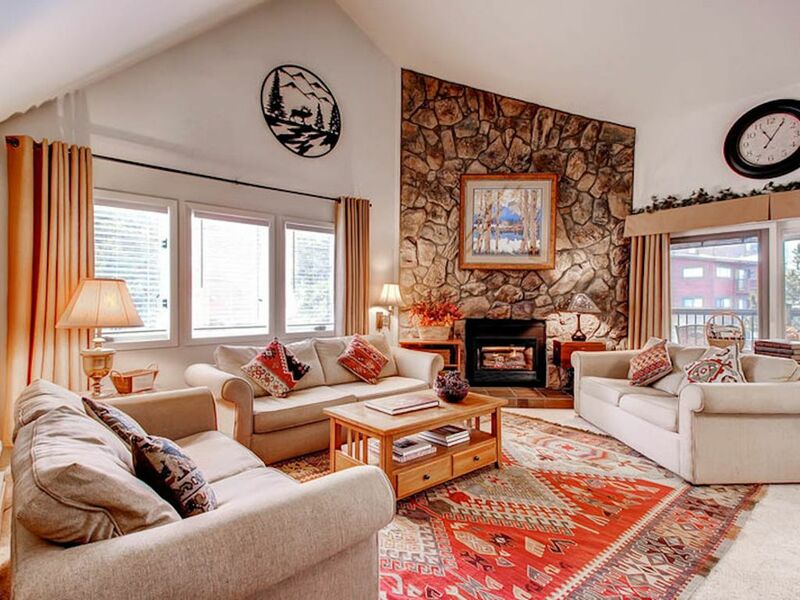 This was a nice condo, located near town, and in walking distance to ski lifts and free shuttles. This house has a great book and movie selection, as well as family games if you have time. We had a great time and this place met our needs. This isn't a luxurious place but it is clean and has comfy beds. We are delighted that you enjoyed your stay and your time in Breckenridge! We look forward to hosting you again in future. Great home, just as pictured! We had a lovely time visiting Breckenridge. This property is ideally located, beds are comfortable, and we had plenty of space for our family. Rates are subject to change until reservation is confirmed.